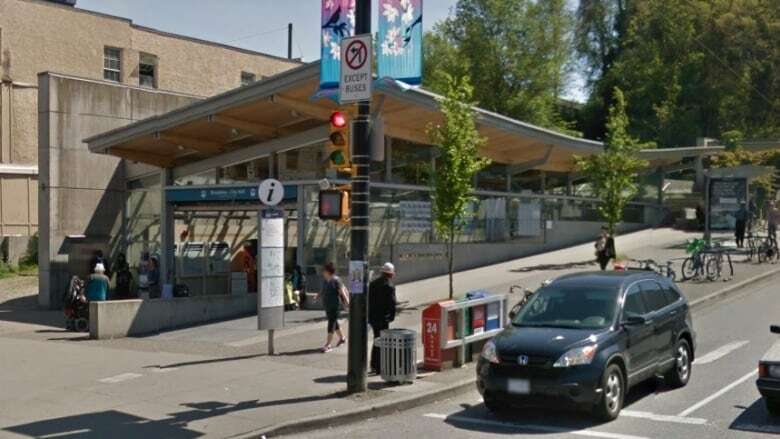 A man says he's fortunate his injuries were minor after he was allegedly attacked after intervening in what he says was a racist tirade directed at a woman and her son at a SkyTrain station. Transit Police are seeking a man for allegedly attacking a male passenger and hurling racial insults and threats at a woman and her adult son. On the afternoon of Aug. 22, a witness — who is being kept anonymous to protect his safety — transferred from the 99 B-Line bus to the SkyTrain at Broadway-City Hall Station in the course of his Saturday errands. When he got into the station, the witness says he observed a white man unleashing a racist tirade against an Asian woman and her son. "Go back to the country you came from," the witness alleges the white man said before hurling a number of racial epithets at them. The witness says when he stepped in and told the man to stop, he says the man said there was a "war going on" and he was going to "take us out." The situation escalated from there, the witness said. "He turned on me and repeatedly tried to goad me into a fight," he said. "He kept pacing back and forth. His words were basically, 'get out of the f--king camera, ... so I can beat the s--t out of you.'" The witness then began video recording the situation with his cell phone: in the video, the white man appears to spit on him and then threatens him further. Then, the witness says, the man attacked him, violently and repeatedly slamming him against a wall. The witness says he's lucky his injuries were minor: he got the wind knocked out of him was scraped up and still has soreness in his neck and shoulder. "I'm fortunate, very fortunate, it wasn't more serious," he said. Transit Police spokeswoman Anne Drennan backs the witness's version of the story. She says an investigation into the incident is "very active" and police have a "very good lead" on the man in the photos and video, and they're asking him to turn himself in. She wouldn't disclose if Transit Police knew the man's name, and when asked if the man has been involved in other incidents on TransLink property, she only said "possibly." The witness hopes by telling his story the man will be held accountable for his alleged actions. "He's out there," he said. "If you see him, stay safe, be careful and don't do what I did." As Transit Police have not identified the suspect, released an image of him or charged him with a crime at the time of publication, the CBC, on the advice of its lawyers, will not publish images or video purporting to represent him.